Spain has an endless coastline with palm trees, a deep blue ocean and rustic landscapes further inland. This makes it an attractive place to camp for many people. 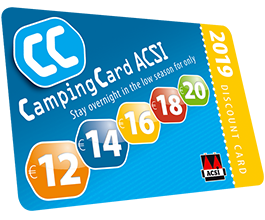 With an average temperature of 19 degrees Celsius in low season it is a fine country for bargain camping with CampingCard ACSI. This mountain range was originally a gold mine during the Roman Empire. Nowadays it is one of Spain’s most famous national parks. The red rocks look stunning against the background of green hills. Amongst these great rock formations you will find many walking routes that guide you through the mountains. On the way, you will see mighty chestnut trees that are centuries old. Andalusia is the southern-most region in Spain. It’s a beautiful place to go cycling in autumn and spring. For example, visit Seville, located on the Rio Guadalquivir river. The city has characteristic patios and an impressive cathedral. From Seville, you can continue your route along the Rio Quadalquivir and head in the direction of Italica, where you can view ancient Roman ruins. In the region Castilla-La Mancha you will find the authentic windmills from the famous novel by Cervantes: Don Quixote of La Mancha. From the old town Toledo there is a beautiful walking route through rural surroundings which will allow you to take a close look at these windmills. On the Spanish Costa Brava you will be camping at bargain prices near romantic Spanish beaches. At first sight you may think a holiday here is only about relaxation, but on this stretch of coast you will also find plenty of things to do, such as swimming and diving. For the adventurous camping enthusiast the diversity of the interior offers a host of possibilities. For example, explore medieval villages such as Aínsa and Miranda del Castañar. The campsites in Spain are just as variable as the Spanish landscape. 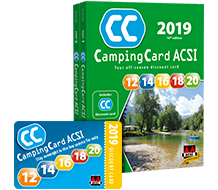 Along the beaches you will find big, luxury campsites where you can camp with your CampingCard ACSI at inexpensive rates and still make use of the extensive amenities. If you would prefer a quiet, intimate campsite, the smaller campsites in the interior are a good choice. Food is a big part of Spanish culture. Typical Spanish dishes are, for example, paella; a richly filled dish with saffron rice and, among other things, seafood and chicken. Tapas are another well-known type of food. By ordering numerous of these small, tasty dishes (such as Spanish ham, olives and sausage) you will quickly become acquainted with Spanish cuisine. It is common for Spanish people to eat out about four times a week. They prefer to have a warm meal twice a day, at 3 pm and at 10 pm, and like to drink a glass of wine with their meal, including the one at 3 pm. The temperature in Spain is relatively warm during the entire year. In spring and in autumn the temperatures are still around 19 degrees Celsius, which makes the country exceptionally suitable for an active walking or cycling holiday. Spain is a good option for people who like to spend the winter in Southern Europe. In the south of Spain especially the temperatures will not sink below an average of 10-15 degrees Celsius.